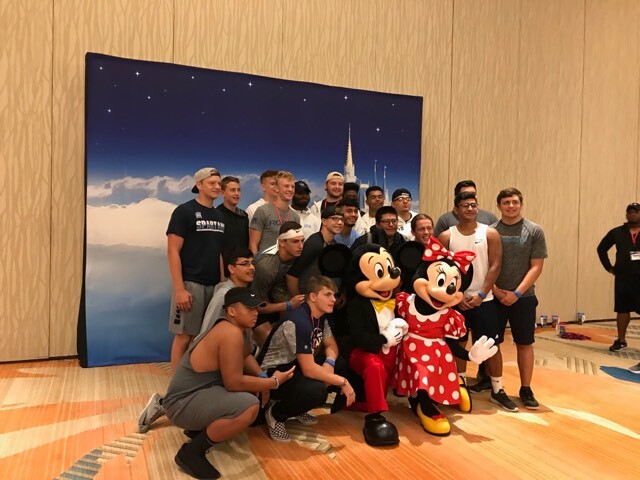 Members of the Greeley West football team pose for a picture with Mickey and Minnie Mouse at Disney World during their recent trip to Florida. On Wednesday, August 29, the Greeley West football team left for Florida at 3 a.m. Given they were leaving at such an odd time, the Spartans spent the night in the gym. Given they had slept on a gym floor and had been awaken at 3 a.m., most of the team slept on the plane ride. By the time they had landed, it was already 4 p.m. Since they were there for a game, the team ran through a quick practice before doing anything else. Thursday’s focus was football, and the team started the day with a pep rally for the game against Coconut Creek later that night. After losing 21-0, the team got to focus on the rest of the trip starting on Friday. On Friday, the boys were up to hit the Magic Kingdom. Curfew for the team was 11 p.m., which made for a long and exciting day for the Spartans. On Saturday, the team split up. Most of the team went to Hollywood Studios. The team rode a couple of more rides. Then the team went to the water park and did the lazy river and the hundred foot drop water slide. After the waterpark the team went back to the hotel and watched college football. Later that night, the team went to eat at Chinese Steakhouse Hibachi. After dinner the team went back to the hotel to go to bed. On Sunday morning, the Spartans traveled back to Colorado. They used the extra day off (Labor Day) to catch up on much-needed sleep and become re acclimated with the mountain time zone.